There were no brown markers to be found. The tube of brown paint was as hard as a rock. This project was off to a shaky start. Fortunately, Lily and Emmy were excited about the project, and Lily has an eye for color. She told me to add orange to the putrid brown paint I was trying to mix with black and beige paint, and it worked wonders! I painted the trunk on a long piece of paper while the girls started making leaves and hand prints out of construction paper. 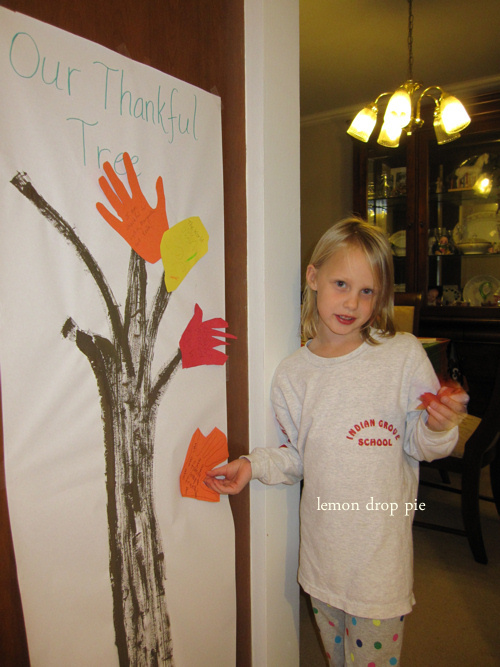 On the leaves we wrote things we are thankful for. Emmy adds her leaf to the Thankful Tree. Lily has learned to pose for my photos! 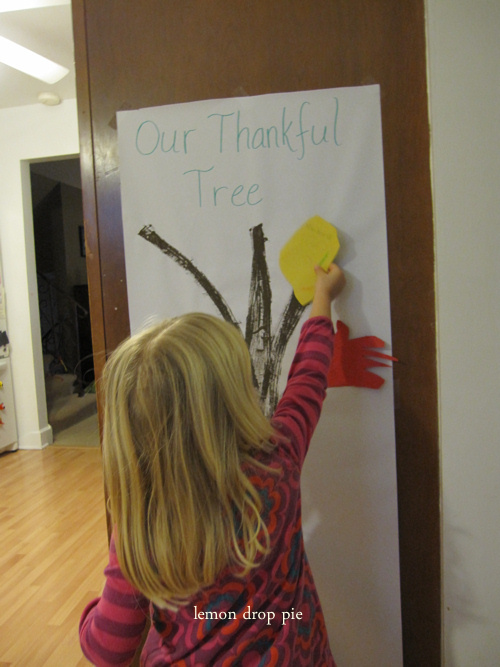 I am so thankful that my children came downstairs this morning, eager to add more thankful leaves to our tree! 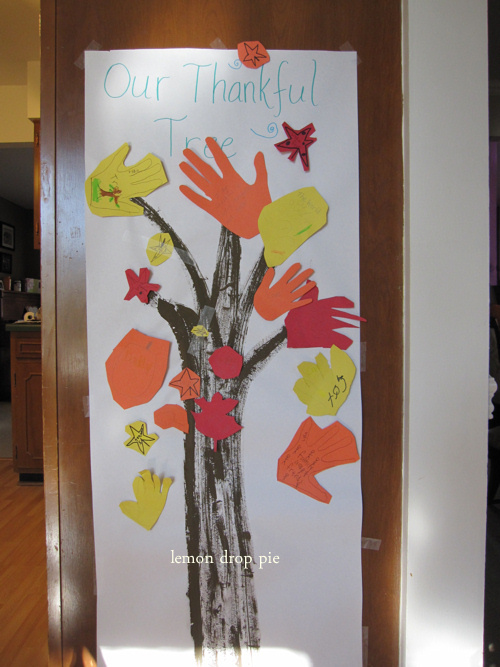 Thank you to There’s Just One Mommy for the Tree of Thanks idea! Your tree is such a beautiful reflection of the tone of your family. What a wonderful reminder, visual for the little ones and the big ones alike about how many blessings have been bestowed on your lives! This post is so timely. 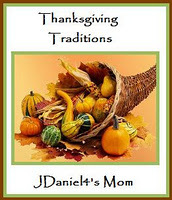 I'm doing one next week about Thanksgiving projects. I guess once a teacher always a teacher! Adorable project and adorable girls! Thank you for sharing! I really loves this tree! I love this idea! I am thankful for so many things and this week I'm thankful for you! You have been such a great help and I appreciate you. Just wanted you to know that :). Great project for the weekend I think – thanks! I can't wait when I have kids to do this! Cute! What a sweet project! great idea! love the tree of thanks. Very cute, and very kid-friendly! What a sweet project for them.